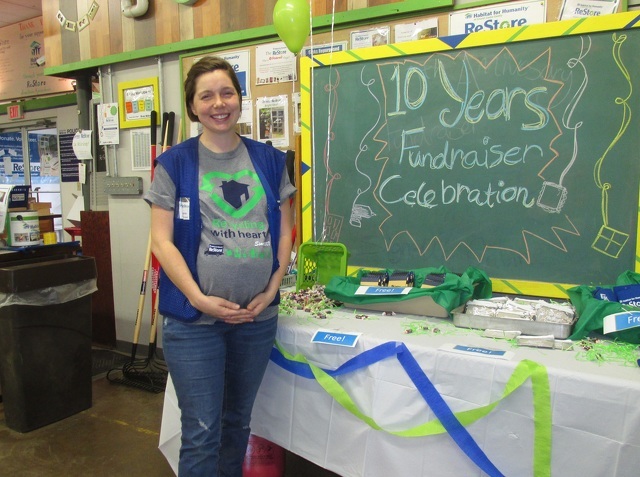 Habitat for Humanity ReStore manager Stephanie Clevenger hosted the store’s recent anniversary event, held Oct. 14 in Bellefonte. BELLEFONTE — The Habitat for Humanity ReStore, 1155 Zion Road in Bellefonte, held a 10th anniversary fundraising celebration Oct. 14 featuring prize drawings for a variety of area business gift certificates, a photo booth, cupcakes and balloons, kids’ crafts and a discount prize wheel. ReStore sells a variety of home improvement and home décor items, including cabinets, flooring, tile, doors and windows, electrical items and tools, all donated by area individuals and businesses. Money raised from sales goes to Habitat for Humanity of Greater Centre County. “One hundred percent of our profit stays right here in Centre County,” said ReStore manager Stephanie Clevenger. She noted the store is staffed by volunteers, and that all donations of merchandise made to the store are tax-deductible. Clevenger said that since the Habitat for Humanity ReStore opened in 2007, it has raised nearly $2 million for Habitat for Humanity of Greater Centre County and has diverted more than 3 million pounds of usable goods from area landfills. “We average 500 individual volunteers a year and exceeded 6,000 volunteer hours for HFHGCC and the ReStore this past year,” she said. “For our recycling efforts last year, we received the Centre County Green Business Emerald Award." She said that payments on the mortgages typically run between $250 and $600 per month. Since the organization's beginnings in the area 34 years ago, Habitat for Humanity has built and refurbished nearly 70 homes and partnered with more than 250 area residents to provide affordable home ownership. In the past year, it has had two home closings. ReStore can be reached by phone at (814) 353-2390, or email [email protected].